Laura got in touch with us to let us know about a fantastic project she is involved in, bringing artists and libraries together. Below Laura tells us all about the interesting project and how you can help. 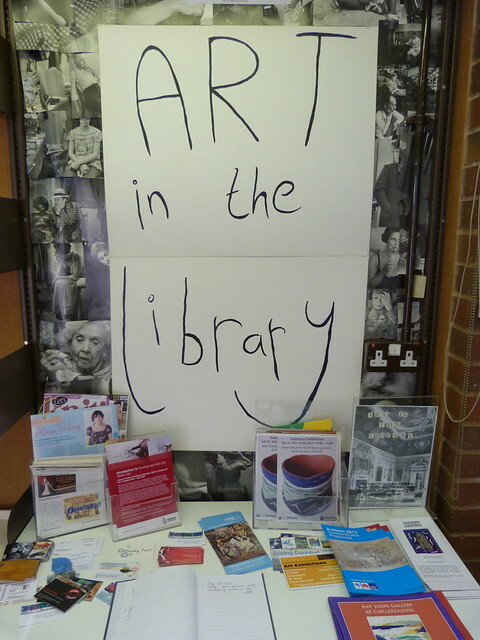 I currently work as a library assistant at Woodley Library, in Reading, Berkshire, where I have set up and run our ‘Art in the Library’ project. I keep a little blog about it all here. What started as a small exhibition space has led to great projects with artists working with local care homes, mental health groups and children all through the library. Having come to work in the library after finishing my art degree it’s very clear to me how much artists and librarians have to offer to each other, and how much networking between the two can benefit the local community. I have seen first hand that the energy and enthusiasm of the arts community often mirrors that of library staff, and furthermore both groups often have shared goals such as promoting culture, lifelong learning and social wellbeing. However based on this personal experience I believe these relationships are very fragmented, often centred around individual enthusiastic library staff prepared to involve themselves in their local arts community. This has inspired me to research further! I am also studying for my Masters in Information Management in the Cultural Sector and just have my dissertation to go. My proposal is titled: ‘The artist in the public library: a case study of benefits of public library engagement with the artistic community’. My plan is to undertake a survey of all the UK libraries in order to understand if and in what ways this engagement is taking place. I also wish to undertake case studies of libraries in the UK that are delivering innovative projects that could be taken as examples of best practice. I would like to ask for your help with the research, if you work in a UK Library please take the time to complete this survey. Also if your library is working on arts projects, or with artists please get in touch I would love to talk to you! My personal email is laura.doggett@hotmail.co.uk and my phone number is 07828299435. Are you involved in an interesting project in your local library? Got a story to tell about your experiences of libraries? Then get in touch at stories@voicesforthelibrary.org.uk. We’d love to share your stories and library projects! This entry was posted in guest posts and tagged Art on August 6, 2013 by Voices for the Library.